“Monsanto is the whipping board for every person that has limited agricultural knowledge and is fearful of what they don’t understand. They are probably credited with saving more lives than any corporation. Without their technology there would be many more deaths because of starvation. I know I will not change anyone’s mind about the company because it takes a lot of time to understand how GMOs and their efforts are good for populations.” Reader comment posted last week. So, let’s take this further….. Mother Jones’ Josh Harkinson analyzed Tesla CEO Elon Musk and his company taking the US Dept. of Energy grant to help bring the Model S electric car to market – how hypocritical it is for Musk and other Silicon Valley entrepreneurs to espouse libertarian politics and then take federal funding. The link to my post in Autoblog Green isn’t working now, but if you go there, scroll down about four articles to find and read my take on it. A biographical PBS documentary on Henry Ford details his accomplished life as the father of the modern automotive manufacturing plant with the Model T, but also digs into his moral quandaries including his antisemitism and how he treated his son Edsel Ford, the second Ford Motor Co. chief executive. Or Thomas Edison, developer of the phonograph and the long-lasting light bulb, for staging and filming electrocution of and elephant to demonstrate the danger of alternating current (AC) and why direct current (DC) should have been adopted by electric utilities. Edison was at war with AC leaders such as Nikola Tesla (sound familiar? ), Westinghouse and General Electric. He didn’t win that fight, but DC is still around (DC faster chargers, for example). These moral quandaries permeate the business world, not to mention politics, albeit in much more sublime and tedious methods than chosen by the legendary Henry Ford and Thomas Edison. Corporate ethics has become a mainstream topic in recent years and is the subject of conferences and professional networks. Along with adopting a sustainability policy, many corporations are investing heavily in improving their image in community service and donations and endorsing organizations dedicated to human health and other worthy causes. Yet there’s no getting away from taking on aggressive, and occasionally manipulative and questionable, tactics for companies to surpass their competitors and to navigate through the regulatory environment. Public image and facing condemnation by activists skilled at tarnishing that image is one thing, and pragmatic reality is another. Alternative fuel vehicles and technologies each have their own walls to climb to reach widespread adoption. Many of these issues have shades of ethical debate behind them, along with huge challenges to overcome. For example…..
Plug-in electric vehicles and the “dirty coal,” nuclear, and fossil fuel natural gas powering electricity plants – plus not enough renewable energy like solar producing electricity; range anxiety and the time it takes to charge EVs can be troubling questions, too. Natural gas vehicles (NGVs) and hydraulic fracturing (“fracking”) and other shale and methane field extraction dilemmas; plus the higher cost of converted vehicles compared to gasoline and diesel-engine vehicles – and the need for more natural gas fueling stations. Hybrids being more costly and competing with cheaper fuel efficient models, which gets trickier if gasoline prices soften. Hydrogen fuel cell vehicles offering zero emissions but being too expensive and having hardly any fueling stations; plus the question of where the hydrogen is extracted from and the safety of the vehicles; pins and needles can still be raised for some people by mention of the infamous explosion of the Hindenburg hydrogen-powered aircraft. Propane autogas is many times not taken as seriously as natural gas – including federal lobbying by T. Boone Pickens and colleagues for NGV commercial vehicle incentives. There’s resentment that propane is being treated as sort of a step cousin to natural gas while its fuel stations are all over the country and it offers clean fuel much cheaper than gasoline and diesel. Biofuels: The corn ethanol E15 battle and Renewable Fuel Standard clash (see lead story for this week). 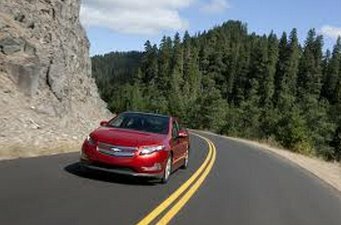 Not long ago, the Detroit 3 had been pushing flex-fuel vehicles and building a bunch with few people finding stations to put E85 into the tank or even trying to; and then there’s the food versus fuel battle – and the struggle of advanced biofuels ever scaling up and being consumed at that same level. Fascinating alternative fuels like Volvo Truck’s DME, Rentech’s synthetic fuels, methanol coming back, renewable natural gas (see coverage of Clean Energy’s Redeem), and algae fuel – but they’re in very early stages and need a ton more backing to go anywhere and deliver their true offerings and benefits. It sure sounds good, but…….. The point being: It’s a very big topic, but here are a few things to start thinking about…. Tell a great story and stick to it; tap into every funding source and incentive you can find; partner with stakeholders to build the infrastructure; get butts in seats at ride-and-drives and get fleet managers to test them out; and stick to it – that’s what Musk, Ford, and Edison would probably agree upon when offering advice about succeeding. Alternative energies are having an extremely tough time of it lately – from alternative fuel vehicle fueling and charging infrastructure to development of renewable energies – public and private funding has been drying up for many projects. Biofuels have been going through the wringer – much of it tied into the struggle over corn ethanol being used as E10 in gasoline and potentially as E15 if it survives the political battle. 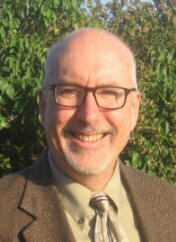 Much of the controversy is also tied into the federal Renewable Fuel Standard, which many analysts think is quite unrealistic for bringing advanced biofuels into transportation at a large scale level of production. A few of the public companies have lost their market value as disappointed investors have pulled out and put their money into something else like smartphones and mobile applications. 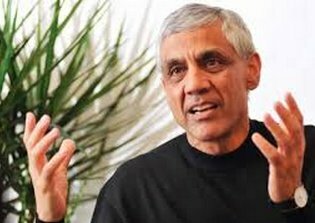 Then there’s Vinod Khosla, one of the leading venture capitalists out there these days. Khosla hasn’t backed away from biofuels and is dropping down more cash on cellulosic biofuel producer KiOR Inc., He committed personally to fund up to $25 million in cash to KiOR, in addition to the $25 million that would come from his firm Khosla Ventures. KiOR just announced that it will be doubling production at its Columbus, Miss., cellulosic fuels facility through setting up a second plant incorporating its own commercially proven technology. The company estimates that the development project will cost it $225 million; it will take 18 months to complete after breaking ground and the company is raising equity and debt capital to fund the construction project. Khosla and other investors have seen biofuel companies take a deep dive on the market. Amyris Inc., Gevo Inc., and KiOR experienced collapse since their initial public offerings. Operational and technical delays have caused investors to pull away. It’s possible the Khosla could be part of bringing KiOR back and his company has made sizable investments in Amyris and Gevo. Khosla believes biofuels could play a vital role in America’s economic prosperity and security. “The biofuels industry, if properly funded, is also capable of creating more jobs, with unsubsidized economics, than traditional fossil oil technology and putting every mill town in America with a shut down paper mill back in business as a thriving community,” Khosla wrote in the KiOR statement. The US Dept. of Agriculture has played a key role in supporting biofuels and has now placed a new offering on the table. Farmers and rural businesses in 22 states are being offered incentives to help reduce energy consumption and increase the use of renewable technologies; a number of biofuels- and biomass-related projects are part of the federal program. The Rural Energy for America Program (REAP) program provides a grant for up to 25% of eligible project cost plus additional funding in the form of a loan guarantee. Some of the available grants include those supporting flexible fuel pumps in California; E85 and biodiesel blender dispensers in Iowa; equipment to efficiently manufacture biodiesel and a biomass burner in Indiana; and two separate biomass boilers in New York. The US Supreme Court has decided that it won’t be hearing appeals on a federal appellate court decision upholding the Environmental Protection Agency’s push toward having gasoline go from 10% ethanol blend to 15%. That isn’t going over too well with several automakers, fuel companies, and as few car buffs. The EPA stands behind E15, insisting its safe for cars model year 2001 and later. Chrysler hasn’t approved E15 on current vehicles, and other automakers are making decisions on whether E15 will void the warranty on the car. What’s coming next for E15? Will E15 put a dent in fuel economy? That’s still an unknown, and ethanol is known to have less driving range than gasoline. 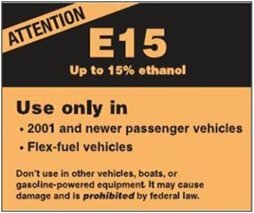 E15 may cause more corrosion and other damage to engines and fuel systems than E10. That’s brought out the objections expressed by automakers. When did all of this start? As part of the Energy Independence and Security Act in 2007, it was stipulated that refineries had to add increasingly greater quantities of biofuels like ethanol into the production of gasoline. As for court rulings, in August of last year, a Circuit Court of Appeals in the District of Columbia ruled that trade groups who’d filed suit lacked standing to sue. As for now, the Supreme Court is allowing this decision to stand. It doesn’t mean the issue is settled completely; sometimes these types of court cases take another form – addressing other legal issues and court rulings – and make their way successfully to the Supreme Court. That would take several years, though. It is going to take a long time for E15 to make its way to gas stations across the country. The numbers are small now and automakers will play a role in how widespread it becomes.